Kanazawa presented something of a mystery. After I arrived here for a short, exploratory visit in the spring of 2006, I realized that I had to look for the things of interest here. Unlike Himeji, where the spectacular Shirasagi Jo (the "white Crane Castle") dominates the landscape, Kanazawa hides its historical sites. Even though what I was looking for was in the center of town, it was not so easily seen. Kanazawa is the capital of Ishikawa Prefecture, near the China Sea coast. It is west and north of Tokyo. For 300 years, from the 1580's, it was a stronghold of the powerful Maeda samurai clan. 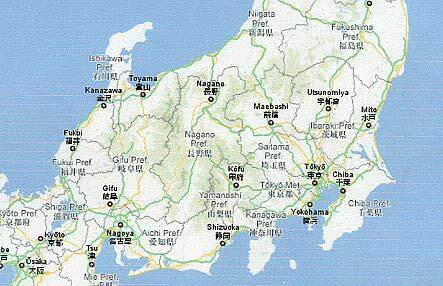 Though a little out of the way, Kanazawa's location was probably an advantage for controlling the surrounding territory (see map). 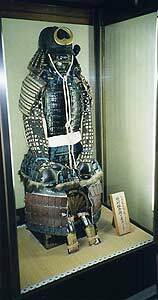 The Maeda clan remained in control of the area until the beginning of the Meiji Period (1868-1912), and what remains to be seen of samurai culture in Kanazawa is a direct result of their influence. In my continuing pursuit of sites around Japan that have both a bearing on samurai culture and an interest for the contemporary traveler, Kanazawa seemed like a good choice on the surface. Upon my arrival, however, I encountered a large, globe-shaped framework covering the area just outside the train station, a tribute to some local business and an obvious greeting to foreign business people. Unlike Himeji, with its castle-dominated streetscape (the town stood in for early Meiji period Tokyo in the film The Last Samurai), or Matsumoto, with its strong sense of historic pride, Kanazawa, at first blush, seemed like any other medium-sized Japanese city, with a postmodern dome over its bus terminal to boot. Happily, I have done this sort of thing often enough that I was utterly undaunted, if initially disappointed. As I often do on these expeditions, I set out walking, map in hand. 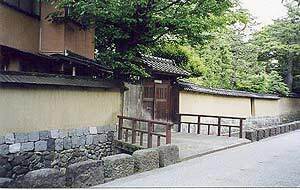 I was looking for the Nagamachi district, which, I had heard, had some old samurai-class houses from the Edo period (1603-1867), not far from Kanazawa Jo (castle). Old buildings like the ones I was looking for can have variable fates. Leaving aside natural disasters, such as fire, floods or earthquakes, and human ones, like war, just because something is old does not mean it has inherent value. Many places simply collapse from age, or are knocked down and recycled. In Matsumoto, the citizenry felt strongly enough about its battle castle to buy it from the central government which sought to demolish it. Other buildings end up in private ownership or put under a sort of national trust, as "Important Cultural Properties," and turned into rather sterile museums. (My favorite indications of national stewardship are the copious signs in English which say, in perfect uniformity no matter where I am: "No Picture No Photo.") In my opinion, the best sites for the explorer are generally the ones that are owned by private individuals or small municipalities. The sites are more visitor-friendly - photos are welcomed and even encouraged - and the guides, mostly local college students, are thrilled at the interest being shown in areas usually off the beaten track. Kanazawa has several old houses one can visit - one that belonged to the middle-upper-ranked Nomura samurai clan, a (rich) merchant's house, and a couple of places formerly belonging to people of humbler status. The old and new very often sit side-by-side in Japan, and so it is in Kanazawa, but with a twist: many of the old houses have been absorbed into new structures. An old wall may conceal a new house, a brand-new, though traditional, gate may look in on a very old garden, with a new house beyond it. 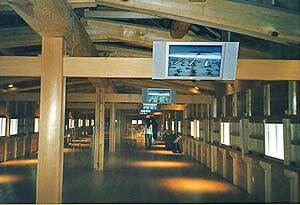 Newer structures have been built over old interiors, as in the case of the Old Ashigaru ("foot soldier") House and the "Samurai District Rest House" (a way station for travelers on official business), Edo Period structures which are open to the public. The houses are modern (though traditional) on the outside, enclosing the much older interiors. I recognized immediately that I had arrived at Nagamachi district because of the walls. The area is easily distinguished by the earthen walls lining the streets. 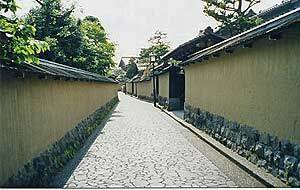 Kanazawa's walls are justly famous for being original; they have not been diminished by fires or earthquakes. They shield the homes behind them from modern street noise and have always provided privacy and deterred intruders. The Old Ashigaru House and the Rest House do not stand out in any particular way from the street, as the exteriors are modern-built. Only modest signs out front alert strollers and invite them inside to visit. 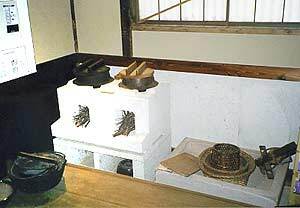 The Old Ashigaru House offers views of the everyday life of someone on the social level of a common foot solder and his family. 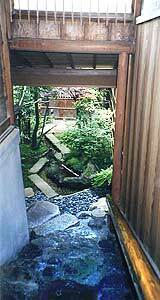 The front entryway has a stone basin with water and dipper so visitors could refresh themselves. The kitchen featured an unusual double-tiered wood-burning stove. The bathroom included the smallest tub I believe I have ever seen, a far cry from the large, group bathing areas of traditional style travelers' rests. The Rest House was similarly small, but less simply furnished, and certainly set up as more of a travelers' inn than a family house. All the same, I definitely got a sense of simple, refined taste that was intended to charm visitors, including a small garden set outside a waiting area. Eventually, my wanderings took me to the Nomura Family Samurai House, surrounded by a wall of its own, and fronted by a small and no-doubt contemporary car-park. 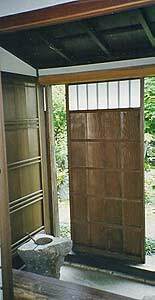 A small plaque at the gate noted that the Nomura clan were upper-middle class samurai with a reasonably good income, and that the builder of the house was a very refined gentleman who enjoyed the finer things in life. 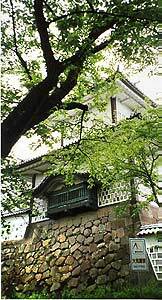 After the Meiji Restoration (1868), a wealthy industrialist bought the house. Though he made some alterations, the house overall remains intact (ASPNF n.d., 2). 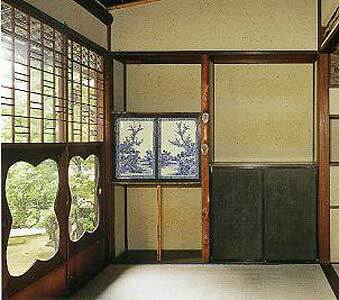 The Nomura clan house was gorgeous, like a Nijo-jo, the Shogun's residence in Kyoto, writ much smaller. In fact, some of the screen designs were painted by members of the Kano school, who also designed and painted the interiors of the Nijojo (ASPNF n.d., 2). This little two- storey house is the epitome of what one normally thinks of as Edo period elegance - balance in proportion, clever use of natural materials, restrained ornamentation. The house includes a tiny tea garden, and the tea room, for lack of space, is on the second floor. 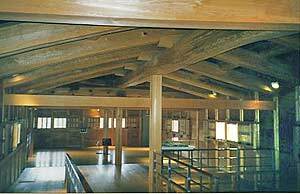 Appropriately, it is referred to as the Jodan no Ma (upper level space). As spectacular as the garden was from the ground level, it was even more beguiling from above. It truly made me wish I had a better camera. 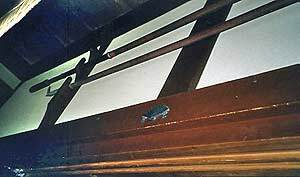 As in most samurai houses, polearms were hung over the entryway for use by the household in case of attack. Once inside, a suit of armor greets visitors, a concession to the house being on view to the public. Elegance and beauty could be seen from every corner. 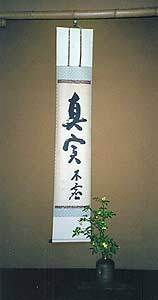 The numerous tokonoma (areas set aside for aesthetic display) included calligraphy scrolls and flowers of the season. The entrance to the tea room combined the traditional pathway with a steep, cobbled slope to the second floor. One could ask why exploring old houses would be of any sort of importance to a martial artist, and it's a good question. I have met more than one expatriate American martial artist in Japan who has seen little outside the dojo space where they train. Sometimes we focus so hard on learning our techniques we forget to examine the sensibility that informed our practice and had a bearing on its development. As Japan stabilized as a country, members of the samurai class, especially the moderately well-off, could afford aesthetic pursuits, tea being one of the big fads (for lack of a better expression) of the time. Tea, flower-arranging, poetry, and calligraphy were part of a cultivated life, and it would be shortsighted to think such a pursuit did not have some impact on the world view of a practitioner's martial art. I have to also admit, that as a New Yorker, a place in which space is perpetually at a premium often without regard to wealth, seeing stunning design in a small space has the effect of opening the mind (just the effect a tea garden should have). I also went to the Shinise Museum, also known as the "Old Merchant's House." I could not help but note that it was much grander. The Old Merchant's House combined a shop and storeroom for Chinese medicine with luxurious living quarters for the merchant and his family. The shop was established in the mid-18th century and the owners became so important to the Maeda clan, they were given very high status by the daimyo (Kanazawa Shinise Memorial Hall, n.d., 1). Samurai class people were sometimes quite wealthy, but generally speaking, a successful merchant was probably better off. The décor was not as tasteful or artistic, though whether because the wealthy builder had less refined taste or not, no one knows. It was certainly a much larger structure, and serves at this point as a museum of commerce for the town emphasizing the family's business. Though not so elegant as the Nomura Family Samurai House, the Old Merchant's House opened a window on what it was like to own (and profit from) a successful business in the 18th century. The next day, I explored Kanazawa Jo. In earlier times, the walled enclosure would have included a battle castle, but, as in the coastal town of Ako, battle castles had become passé by the later Tokugawa Period. Unfortunately, the grand structures that did house the Edo Period administrators and served as living quarters for the members of the Maeda clan were destroyed by fire long ago. 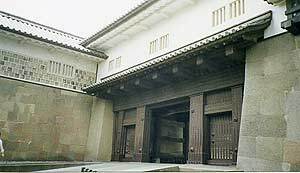 The walls, which also burned (and probably suffered from neglect after Tokugawa times), were reconstructed as recently as 2001, on the site of the old ones, the stone foundations being left intact. The walls were monumentally huge, the smooth, white upper walls set with shiny, grey lead tiles. Though there was no battle castle, the turrets erected at intervals along the walls were equally large and imposing. 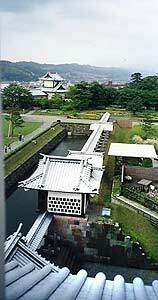 The Hishi Yagura, at three stories, was the highest, commanding a view of multiple gates for tactical advantage. The whole impression was something along the lines of "we're at peace, but…"
In my experience of wandering around rebuilt castles, I have found that, while the exteriors are imposing, the linoleum floors and plain white walls of the interiors remind me uncomfortably of my old high school. Fortunately, more recent assessments of historical sites in Japan (and probably healthier budgets) have allowed for more authenticity in reconstructions. Imposing as it was on the outside, once inside, visitors were treated to an exhibit on Edo Period building methods, some of which were employed in reconstructing the walls and turrets (though I doubt that wood screws were very common in the 18th century). 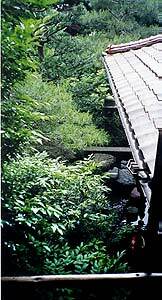 There was lots of information about construction techniques; for example, that the original shingles were made from hinoki, the durable, and very expensive Japanese cypress. 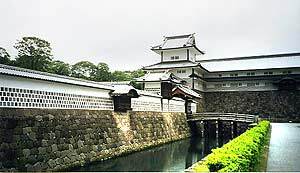 The turrets and supply houses that still can be seen (some of which actually date from the late Edo Period), formed part of the inner defense. 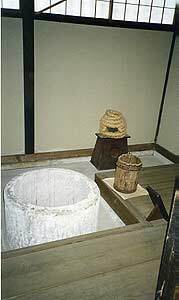 Of particular interest to me, as one who never fails to wake at the slightest earth tremor in the night, were early attempts to construct floors by crossing beams on a foundation of wood, then filling the gap with sand and gravel in an attempt to create a sort of floating floor that could absorb the shock of "jishin" (earthquakes). Though a couple of engineering types I described the method to said it would be minimally useful, I was impressed that builders from nearly 400 years ago were attempting to solve a problem that still vexes engineers today. 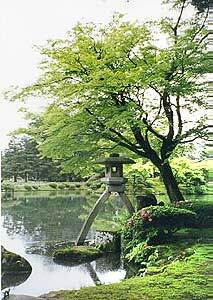 Inside the walls lay another point of civic pride: the Kenrokuen, called the "Second Best Garden in Japan." (There was no mention of "First Best" - if I wanted to know that, I would have to find out where it was for myself.) Maeda clan leaders had been creating, restoring, augmenting and generally fussing over the space since the late 17th century. 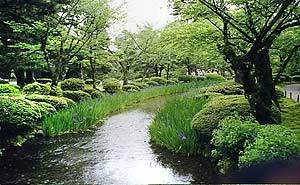 After the Meiji Restoration, the garden was opened to the public and remains a "National Site of Special Scenic Beauty" today. It was beautiful. And it was huge. And it took all morning to see. On a drizzly, cool weekday morning, there were few visitors and spectacular, but restrained beauty wherever I looked. Water iris, just coming into bloom, flanked a curving stream. 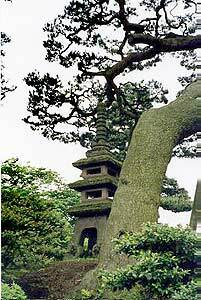 A stone pagoda stood guard against an old tree. 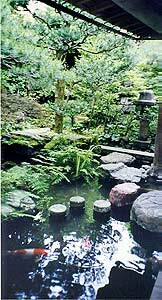 A stone lantern adorned the side of a pond, elevated on long, curved legs. Among other things there was a statue of Yamato Takeru, the legendary ancient hero. 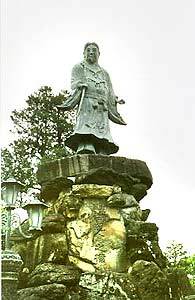 The statue was erected in 1880 to honor the "Ishikawa warriors of the Satsuma Rebellion." I noted two things: (1) Satsuma was a very long way from Kanazawa; and (2) 1880 was well within living memory of the Rebellion, so the statue was probably erected by friends and family members of the fallen. I also noted that the plaque did not mention members of the Imperial Army; i.e., the ultimate victors in the conflict. Unfortunately, there was no further explanation to be had, so I was left wondering about the true nature of Kanazawa - business people or warrior descendants - or both? The last stop on my tour of Kanazawa was a visit to the Seisankaku, a house built in the mid-19th century by Maeda Nariyasu for his mother. Unfortunately, this building was part of the national historic buildings setup ("No Picture No Photo"), but of all the places I went during my visit to Kanazawa, it was most like a real palace in the Western sense. 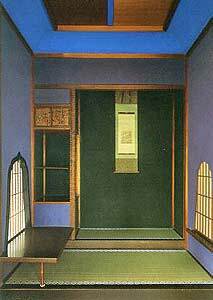 There are many opinions about the status of women in Edo Period Japan, but one thing seemed very clear: this one was held in very high esteem, from the large reception room where she greeted foreign dignitaries, to the upstairs walls coated in pale blue, powdered lapis lazuli. Though I was not allowed to take photos, I am including a couple of postcard shots of the interior, to show just how extraordinary the place really was. I came to Kanazawa not entirely sure what to expect; and on first glance, I thought I was going to be disappointed. But as I peeled back the layers of modernity, I was able to find the samurai heritage underneath. That, and the best sushi I have had anywhere. "Kanazawa Shinise Memorial Hall" brochure (no date).